Learn about Goemans and Associates Optometry and meet the doctors at our clinic. Proudly serving Guelph, Cambridge, and surrounding areas for almost 30 years. Welcome to our brand new website for Goemans Optometry! 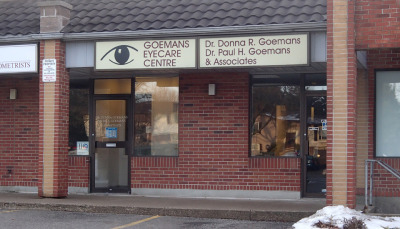 Goemans and Associates Optometry has been proudly serving Guelph, Cambridge, and surrounding areas for over 27 years. We are a family-owned and operated optometry clinic. In addition to eye examinations, we offer a wide variety of plastic and metal frames for every budget and family member, as well as fitting hard, soft, and gas permeable contact lenses. A comprehensive eye examination is recommended for children as young as six months of age, at least once before the child begins kingergarten, and continuing annually or bi-annually going forward. We accept new patients regularly. We conveniently offer Tuesday and Thursday evening time slots and Saturday appointments to make your appointment scheduling easier. We invite you to explore our new website and learn more about the services offered or call us during our business hours to schedule an appointment. Please like our Facebook page to stay up to date with Goemans Optometry. Facebook will keep you informed of office hour changes, updates, and informative links to articles related to your eye health.